The 6th International Working Group on Women and Sport (IWG) Conference was held in Helsinki, Finland, from 12th to 15th June. With the inspiring theme, “Lead the Change, Be the Change,” the IWG Conference kicked off with great enthusiasm and excitement, creating a thoroughly welcoming atmosphere. But along with the fun, it provided a valuable opportunity for us all to learn about current research and trends, to identify ongoing challenges for women and girls in sport across the globe, and to share experts’ views on the next steps to be taken. 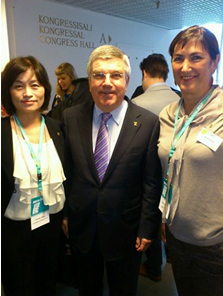 As IOC President Thomas Bach announced in his inspirational remarks at the Opening Ceremony, the conference had some 800 eager participants from 100 countries. Marisol Casado, IOC member and President of ITU, also contributed in a parallel session under the theme of Winning Women – Closing the Gender Gap in Elite Coaching. She delivered a convincing speech in which she reminded us that women must take a leadership role, find support, network with both men and women, and keep up the good work! We participants took full advantage of them, attending panel discussions and forums, and participating in workshops from 8:30 a.m. until around 19:00, to gain as much insight as possible. In between, we also did valuable networking and appreciated activities headed up by volunteer performers from the host city and abroad. 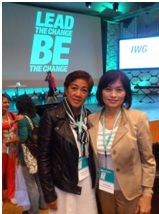 Among the attendees were Ting Joson from the Philippines and myself from Japan, representing the ITU Women’s Committee. Supported by the IOC, the IPC, NOCs, international sport federations, United Nations organizations, WHO, and many other stakeholders, including academic institutions and individuals, the conference covered various areas related to the empowerment of women and girls in sport at all levels and the facilitation of physical activities and sport culture. It was successfully closed with the issuing of the Women and Sport Progress Report 1994-2014, comprising a review of the implementation of the Brighton Declaration on Women and Sport (1994) and multiple research conclusions reached to date, and by adopting the Brighton Plus Helsinki 2014 Declaration on Women and Sport. Finally, I am happy to note that Dr. Raija Mattila and Dr. Johanna Adriaanse, Co-Chairs of the IWG, as well as Dr. Anita White, Ex-officio of the Anita White Foundation and a conference panelist, have been our external expert reviewers for the ITU Women’s Committee Award of Excellence since it was launched in 2012. I appreciated having the opportunity to express our gratitude personally to those three able women on behalf of the Women’s Committee. In this, the 25th year since the foundation of the ITU, I look forward to continuing to work closely with both committee members and Executive Board members as we endeavor to facilitate the involvement of girls and women in triathlon on each continent, and promote the well-being of women in sport and through sport.